A fascinating fish, the Sabertooth Characin has a mouthful of needle-sharp teeth and two large fangs! The Sabertooth Characin Hydrolycus armatus is one of the Sabre Toothed Tiger Fish. These fish belong to the Cynodontidae family and are also called Dogtooth Characins or Dogteeth Tetras. The Hydrolycus genus consists of four species known collectively as Pirandirá, and are often referred to as Payara. Primarily known as a game fish, the Payara are prized by fisherman for their fighting ability. They inhabit fast moving rivers and are often found in schools. The common name Sabertooth refers to the two large fangs that protrude from its lower jaw. These two teeth are so long that the upper jaw has holes for them to fit into. This voracious carnivore is fast and aggressive. It will usually grab its prey whole, trapping the smaller fish in its mouth, then adeptly manuveur it about to be swallowed head first. If the prey is too big, however, the Sabertooth Characin may first chop it into smaller, bite-sized chunks.Like all Saber Tooths, the Sabertooth Characin grows quite large. If you want to keep one as a pet, be prepared for a high feeder fish bill! In the wild, the Sabertooth Characin can grow over 23 1/2 inches (60 cm) in length. Though only about half the size of its close relative, Hydrolycus scomberoides, commonly called the Payara or Vampire Tetra, it is a very big fish that needs a large volume of swimming space and plenty of food. They are occasionally available and will readily adapt to aquarium life, but they are most often short lived. Payara generally survive only 6 months to a year in captivity, though there are reports of a few having survived up to 2 years. Their short lifespan is sometimes attrbitued to aquarists attempting to keep them in unsuitable environments. Cool video of a Sabertooth Characin feeding! Note - the music on this video is loud and might be jarring to some, so you may want to turn down your speakers before watching. The Sabertooth Characin Hydrolycus armatus was described by Jardine & Schomburgk in 1841. This species is not listed on the IUCN Red List. 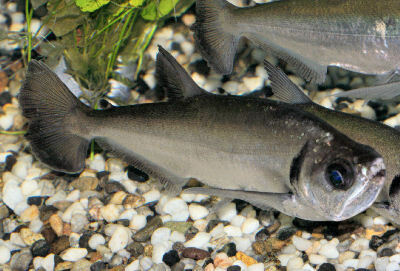 All members of the Cynodontidae family are known as Sabre Toothed Tiger Fish, Dogtooth Characin or Dogteeth Tetra. The genus, Hydrolycus, consists of four species collectively known as Pirandirá or Payara. Sabertooth Characin are found throughout the eastern and central portions of the Amazon River basin in South America as well as in the Rio Orinoco and Essequibo River in Guyana. They inhabit clean, fast-flowing waters, including rapids and at the bottom of waterfalls. They are often found in loose groups and feed on smaller fish. Social Grouping: Groups - In the wild, these fish are found in loose groups. The Sabertooth Characin has an elongated body that is streamlined and very powerful. It tapers towards the tail and has a large fan-shaped caudal fin. This iridescent silver fish has semi-transparent fins that are tinged with black towards the outer portions and sometimes spotted with white. The large, upturned mouth is full of needle-sharp teeth, and the lower jaw features two long fangs. The fangs are so long that the upper jaw has holes for them to fit into. It is an iridescent silver fish with fins are semi-transparent, tinged with black towards the outer portions, and sometimes spotted with white. In the wild, the Sabertooth Characin can grow over 23 1/2 inches (60 cm) in length. In captivity, however, it is unlikely they will achieve a size of much more than about 12 inches (75 cm). Their lifespan is unknown, but in captivity they usually only live six months to a year, with a few successfully kept for up to 2 years. It is almost identical in appearance to its close relative, the Vampire Characin or Payara Hydrolycus scomberoides, but the Vampire is almost twice as arge. The Sabertooth Characin can also be distinguished from its cousin by a small dark spot on its gill cover that is oblique in shape, while the same marking on H. scomberoides is more circular. Lifespan: - They often only live 6 months to a year, with just a few reported to have lived up to 2 years. The Sabertooth Characin is extremely difficult to keep. It needs a very large tank of at least 200 gallons and a better-than-average filter system. Their water must be of excellent quality and highly oxygenated. These fish sometimes refuse food in captivity, and once feeding, need a varied diet of fish. Furthermore, if this fish is startled, it has been known to injure itself frantically trying to escape. They have been known to injure themselves in frantic efforts to escape. These fish often only survive for 6 months to a year, with just a few reported as living up to 2 years. This may be a result of a large bio load resulting in nitrogenous waste. An extremely large aquarium is required to support a school. Aquarium Hardiness: Difficult - This fish requires a lot of swimming space and extremely well-oxygenated water to survive. They have also been known to injure themselves in frantic efforts to escape. Aquarist Experience Level: Advanced - The aquarist must maintain a very large tank in pristine condition to care for this demanding and expensive fish. Sabertooth Characin are carnivorous piscivores. They only eat live foods, and they love fish. Appropriate aquarium fare includes live foods, such as feeder fish, earthworms, and river shrimps. These fish could probably be trained to eat whole dead fish, such as frozen silversides and lancefish, but this has not been confirmed. Live foods (fishes, shrimps, worms): Most of Diet - This fish prefers a diet of raw fish, though river shrimp or earthworms are suitable substitutes. It may be possible to train this species to accept whole dead fish, but this is unconfirmed. Sabre Toothed Tiger Fish are big, messy fish that need pristine, well-oxygenated water and extremely high filtration. Aquariums are closed systems, and regardless of size, all need some maintenance. As with most predatory species, these fish produce a lot of waste, so a highly-efficient filter is needed. Over time, decomposing organic matter, nitrates, and phosphate build up and water hardness increases due to evaporation. To combat these ever-changing conditions, water should be replaced on a regular basis. Weekly water changes of 30 to 50% are recommended. Water Changes: Weekly - Do a 30 to 50% water change every week. A Sabertooth Characin needs a large home. When first purchased as a small juvenile, it may initially be kept in a large home aquarium. But eventually, you will need to provide a tank of 200 gallons or more with a better-than-average filter system. Excellent water quality is a must, and it must be very well oxygenated. Younger specimens may tolerate mild moderate water movement, but adults should have strong, turbulent currents. The decor should be minimal, but can have some caves for retreat. These are very active fish and will need a great deal of open area for swimming. The aquarium also needs a tight fitting lid. Although they are not really jumpers, they have highly developed pectoral fins to aid in rapid pursuit of prey, and they may shoot out of the water. They frighten easily, so be careful not to make any quick movements around their tank. Payara have been known to fatally injure themselves by swimming into the sides of the aquarium when disturbed. It helps to cover the sides and back of the tank with either a dark aquarium background or paint them with a dark color. An overly bright light will also stress them out, so keep the lighting moderate and have some areas that are dim. A more subdued lighting coupled with a dark backdrop will bring out their best coloring. Lighting Needs: Moderate - normal lighting - Moderate lighting with some dim areas in the tank is best. Water Region: Middle - They will swim mostly near the middle of the tank. In the wild, the Payara is often seen in groups, but in captivity, they tend to become belligerent towards their conspecifics when kept in small groups. An ideal situation would be a school of 6 or more in a very, very large space. Otherwise, keep them singly. They can become aggressive and have been known to attack fish too large for them to eat. Other very large fish may survive with them, such as a calm armored catfish, but Sabertooth Characins are best kept singly. When kept singly, however, they can become nervous, especially if there are any quick movements around the tank. When startled, they may respond by swimming frantically and even damaging themselves in their panic. The Sabertooth Characin does not do well in crowded situations and won't survive without plenty of room. Even though other large fish, such as a Pacu or large catfish will probably be able to survive with it, the Sabertooth will do best kept alone in a single specimen tank, or again, in a very, very large environment as a school. Temperament: Large Aggressive - Predatory - This fish does best in a species tank as it will generally be aggressive towards tankmates and doesn't live long in crowded conditions. It should be kept either singly or in a small group in a very large tank to reduce aggression. Same species - conspecifics: Yes - Either keep them singly or in a school of 6 or more in a very large aquarium. Peaceful fish (): Monitor - Calm armored catfish could survive with this species, but Sabertooth Characins have been known to attack other fish of all sizes. The Sabertooth Characin has never been bred in captivity. Not much is known about the courtship and spawning behaviors of the Hydrolycus species. However, Payara are a migratory fish and begin reproduction with the onset of the rainy season. They move from lakes and river channels into the rising waters of large rivers, migrating long distances upstream for spawning and feeding. Presumably, it would be difficult to impossible breed them in an aquarium and would require a very large tank. For a description of breeding characin fish, see Breeding Freshwater Fish: Characins. Ease of Breeding: Unknown - This fish has not yet been bred in captivity. This is a large, difficult fish to keep. The biggest obstacles to keeping the Sabertooth Characin are providing adequate space and food and maintaining their environment with pristine, highly oxygenated water. Even when these needs are met, these fish do not survive long in captivity. They often live only for 6 months to a year, though a few have been reported to have lived up to 2 years. As far as disease, these fish are hardy, and disease is not usually a problem in a well-maintained aquarium. That being said, there is no guarantee that you won't have to deal with health problems or disease. Anything you add to your tank can introduce disease. Not only other fish but plants, substrate, and decorations can harbor bacteria. Take great care and make sure to properly clean or quarantine anything that you add to an established tank so as not to upset the balance. Because these fish eat live food, disease can be passed to them from their foods. Make sure to quarantine live food before feeding. An outbreak of disease can often be limited to just one or a few fishes if dealt with at an early stage. When keeping more sensitive types of fish, it is common for all fishes to be infected even before the first warning signs can be noticed. The best way to proactively prevent disease is to give your Sabertooth Characin the proper environment and a well-balanced diet. The more closely their environment resembles their natural habitat, the less stress the fish will have, making them healthier and happier. A stressed fish is more likely to acquire disease. As with most fish, Sabre Toothed Tiger Fish are prone to skin flukes, parasitic infestations (protozoa, worms, etc. ), ichthyobodo infection, parasitic infestations (protozoa, worms, etc. ), bacterial infections (general), and bacterial disease. Aquarists should read up on common tank diseases. Knowing the signs and catching and treating them early makes a huge difference. For information about freshwater fish diseases and illnesses, see Aquarium Fish Diseases and Treatments. Sabertooth Characin are occasionally available, but they take up a lot of space when shipped from South America, which drives up their shipping costs. If you are lucky enough to find one for sale, the price will be high. Before you purchase this species, be sure to check with the Fish and Game Department or other environmental authorities in your area to be certain that you can keep one of these fish. In certain states, such as Texas, public and /or private possession of these fish is prohibited, most likely due to concerns that people may unwittingly release them into native waters. I've had my Hydrolycus Armatus for close to a year now and deal with all 4 payara species on a daily baisis. The 'sudden death' of payara in aquaria ONLY applies to the Scomb. species. Most of the information posted above is correct though. All 4 of the payara species can be trained onto dead/frozen foods (such as fresh market fish fillets or frozen silversides), but they are quite stubborn to train, so the use of teacher fish may be a good idea to speed up the process. My Hydrolycus Armatus was 4' at purchase, and is now about a foot. They do require very large tanks with lots of curret and prestine water quality, anything less and they will perrish. They are quite rare (Scombs and Tats are often mislabeld as Armatus so do your research first) as mentioned above, so if you do find one, expect to pay minimum $100. How can you tell the difference between male and female? I think they are okay fish to have and very quick. But I wouldn't recommend them in tanks with fish the same size and more aggressive, because the chances of one dying is really high.